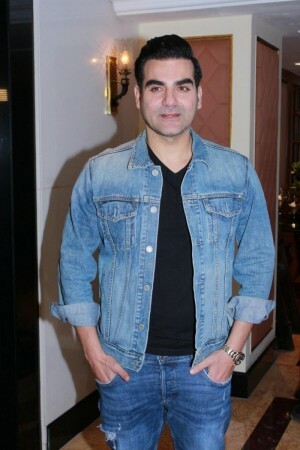 Mumbai, Jan 9: Actor-filmmaker Arbaaz Khan wants to ensure he devotes some time to his love for music and says he will soon start singing lessons. "These days, I am learning the guitar and I will soon start my singing classes. I used to learn music as a child. I always wanted to become a singer. I think we all should learn one musical instrument. And there is no age of learning. Since I am quite stable in my career, after working for more than 20 years, I also want to pursue my hobby. "You never know that after a year or two, I might come up with a song. I know that I have 'sur' in my voice and if I learn to improve the quality of voice with practice, I will be able to sing well," Arbaaz told IANS. On the big screen, Arbaaz will soon be seen in the film "Nirdosh" in which he plays a policeman. He believes people appreciate him in such roles rather than a romantic hero. "I think there are certain characters that fit my personality so well that even people appreciate me on them on-screen. On the other hand, I think people have not appreciated me much for romantic roles, but we should not stop experimenting. You see, we know Salman bhai as an action hero, but he is experimenting with his image -- whether it is in 'Bajrangi Bhaijaan', 'Tubelight', 'Sultan' or 'Tiger Zinda Hai'. "We might fail at a time, but that should not stop us. However, I am hopeful about 'Nirdosh', where the plot is quite strong because it is a thriller," he said. Arbaaz has his apprehensions that social media may play spoilsport with reviews giving out the spoiler of the suspense thriller. "This is actually a risky genre because in today's time, it just takes 5 seconds to reveal who is the killer in a suspense thriller. In a romantic film even though you know the boy-meets-girl story, you want to watch it for the experience. But I think people will still watch a suspense thriller film even if they know the climax. We hope the same for our film." "Nirdosh" also features Arbaaz Khan, Manjari Fadnis, Ashmit Patel and Mahek Chahal. It will release on January 19.